The Len'en Project features a variety of characters. With 4 games, the cast has grown to have 39 characters. Yabusame Houlen and Tsubakura Enraku are considered the protagonists of the Len'en Project, and they are the primary playable characters in all games so far. [a] Others usually appear in the games, as support characters, bosses, or with some other role in the storyline. Here is a list of all Len'en Project characters, categorised by their first game or publication appearance. With its focus on characters, the Len'en Project series possesses a decent cast compared to other shoot 'em up games, but their genders are not confirmed. 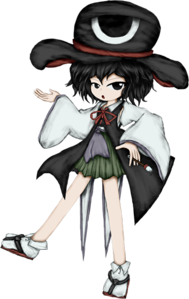 Most Len'en characters reside in a fictional landlock region called Mugenri, where humans and youkai both live, just like Gensokyo . The youkai often prey on the humans while the humans try to exorcise them. A character's most common role in a Len'en Project game is being a boss. With this, they'll have titles and a theme song associated with them. Midbosses however tend to not have a theme. Many characters also have unique abilities, and almost all characters have at least one ability named in the fashion of "something like (ability)" (的な能力, teki na nouryoku), showing their strength and power with various capabilities. 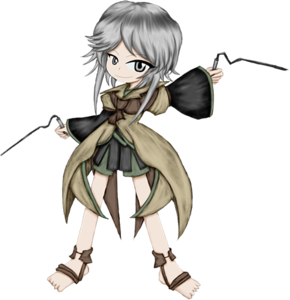 Though each game features a collection of different characters, the main character of the games is always Yabusame Houlen, joined by Tsubakura Enraku. Generally, almost all names for each character are written in the Japanese script, either in hiragana, katakana or kanji. Names generally start with the surname followed by the first name, even when they are written in katakana to show a western name. The names may not truly be actual names in real life, as they may contain kanji to represent the character overall. JynX has provided rōmaji and kana versions for most of the Windows characters; the latter only included if the name's in kanji. On some rare occurrences, JynX would include official English translations of the name. There have been instances in error of rōmaji however, such as those listed here. Some characters only have one name, such as Kurohebi and Jinbei. When a character name has a "no" in the middle, such as with the aforementioned "Fujiwara no Iyozane". Since a proper English translation of that name would be something like "Iyozane of the Fujiwara clan", these kinds of names are left unaltered for convenience's sake. JynX intentionally wants the fans to actually write it the way they've intended, such as with Yabusame's surname: Houlen. Using an l in rōmaji is very unusual since an r would be more standard, but there is meaning to having the l instead. As for the names themselves, there is a certain number of characters know to have a "Bird's Name", where a character's name contains a meaning for birds, for example Tsubakura (玄鳥) literally translates to "swallow". Despite there being species of youkai, almost all the characters take a humanoid form and are notorious to not have a known gender. Their designs are distinct and are based around their characteristics, culture and appearance in a game. It's also noted that almost all characters have some kind of headwear, such as hats or non-human attributes, and that they tend to wear a skirt or shorts. However, there are exceptions to these trends, such as Yabusame Houlen not having a hat and Clause wearing trousers respectively. The designs would be based around the species and abilities a certain character has, such as Shou Amanomori being a slug youkai and can leave traces of slime when they walk barefooted and Sese Kitsugai is a gashadokuro and has relations to bones. JynX has a basis for a step-by-step approach for when they create their characters: They start with the overall world, then a story that relates to this, then the roles. They'll then think about the model characters that would fulfil those roles, probably using ideas from other sources such as books. After drawing the models, they'll add a backstory then finally their species. JynX has not given any character (aside from an odd few) a known gender, despite some of them appearing to players as more feminine or masculine. In fact, it's all up to the player's imagination to decide whether they're male or female as most characters already introduced are likely to never have their gender revealed. JynX was asked why they have taken this approach, and they compared this to animals like a puppy and an eagle, where people would think these animals are adorable without even considering their gender. JynX has, however, said on 3rd Feb 2019 that there might soon be characters with set genders outside of the games. They are revealed in A World That Isn't Fantasy to be Hal and Hoojiro Shitodo. This wiki doesn't make these assumptions, so gender-neutral words are used to keep the characters' gender ambiguous. See here for more information on this. JynX takes on all of the drawings for the characters that appear in the Len'en games. Their distinctive way of drawing is different compared to other artists. They drew significant influence from ZUN 's artwork in earlier Len'en works, but over time their way of drawing has become unique. ↑ When asked about it, JynX dodged the question of whether there will be games where other characters will be the main characters instead. ↑ There's none in-game right now. But something like that might pop up outside the games soon?